Summer Game ‘n Grill 2014. Coconuts: a dexterity game of monkeys catapulting suspiciously squishy “coconuts” into baskets, which get built into pyramids. Lots of stealing baskets and angling to take coconuts out of commission. Sentinels of the Multiverse: on my fourth and fifth plays, I’m really starting to get this game. Enough that I led the second game, and spent some of today thinking it would be a great solo game for when I can’t find anyone else free to flop cards. Betrayal at House on the Hill: always a treat, especially with two scenarios I’ve never played before, one of which was traitor-less. I still feel like the winner was a traitor, though. Mansions of Madness: the previous time I thought I played this game might have been a dream. This time, we played The Yellow Sign scenario, which occasionally intersected with the fustercluck of investigators and cultists that clogged up the main hallway of said disturbed domicile for most of the game. The investigators won, though, so that was a change from my conception of this as a one-versus-many heavily tilted toward the one — which is, admittedly, in keeping with the Lovecraft themes. Bluff / Liar’s Dice: this version had a board with a track that made the rules of betting make a great deal more sense. Still not a game I’d suggest. It was an ungodly gorgeous day outside, but we had a lot of fun hanging out at the Vergennes’ Congregational Church. The venue is very nice, the organizers had everything together — especially the lead, Chuck — and the snacks were better than ever. Green Mountain Gamers put on these free events, running off donations, and they’re always a great time. Congratulations to them for making them happen all year round. Spring Meltdown is mere days away. It feels like it’s been forever since our last tabletop game-stravaganza in Barre, but really it’s only been four and a bit months. Friendly people. 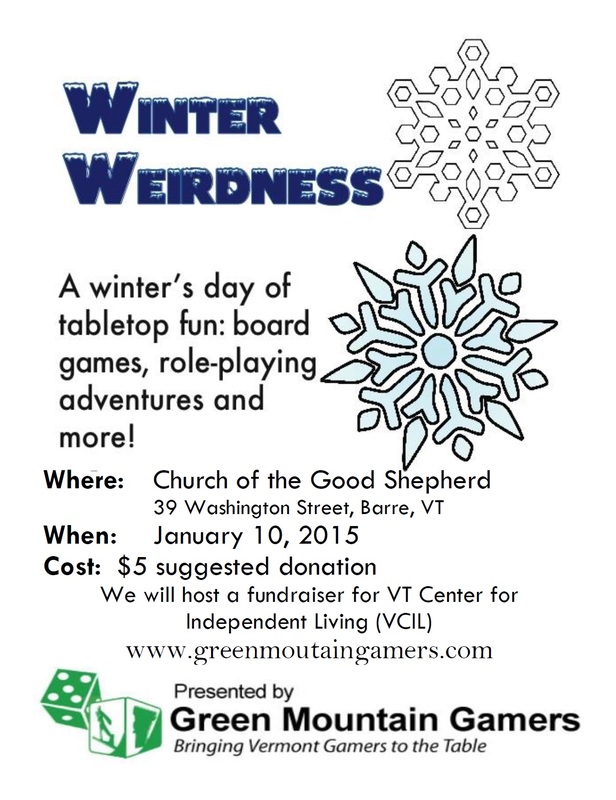 We game-playing Vermonters are quite lucky to have such a great community of fellow hobbyists. We’re friendly and we’ve all got a great pastime in common to share and talk about. A heap of games. I guarantee you that right now as you read this post, someone is thinking to themselves, “Which games should I bring to the next Green Mountain Gamers day?” There’s always an embarrassing richness of choice when it comes to games at these things. If you pick something up from the table, someone’s going to be able to tell you about it, and maybe even play it with you. Twelve hours of gaming. Yes, Spring Meltdown goes from 10:00am to 10:00pm. Some people are there for the whole day for maximum fun. Others come for the part of the day that works for them. Spring Meltdown 2012 happens April 21st at the grange hall on York Street in Lyndonville, Vermont. From 10:00am to 10:00pm, it’s open tabletop gaming. Dark Tower Gaming will run a pair of Magic: the Gathering tournaments. They and Triple Play will be vending, should someone have a gaming-related shopping need. Spring Meltdown, a tabletop game day, comes to Lyndonville, Vermont on April 21st. From 10:00am to 10:00pm at the grange, game enthusiasts gather for some tabletop action. It’s a free-for-all of open gaming, so bring something to share or come eager to try something new among the myriad games other participants make available. Hosted by Green Mountain Gamers, a group of which I’m a part, Spring Meltdown is one in a series of quarterly game days traveling around the state of Vermont. We’ve had a lot of success with the traveling model, meeting gamers from all over the state who we might not have otherwise met. And now we’re headed back to the Northeast Kingdom! By and large, I am lucky to have a job that’s not terribly demanding on my time. Enough so that I can run a role-playing campaign, go to board game night most Tuesdays and skip off for weekend conventions and game days without too much hassle. So when real life crops up in a big way, I do my best to take it with a minimum of ruffled feathers. This week, for instance, I “get” to work on Saturday morning, which is right when Fall-loha kicks off. This is only the second time I’ll have missed a bit of a Green Mountain Game day, the last being the Middlebury Meltdown, when I was laid low by crud. But hey, I’ll still get out to the festivities by the late afternoon, so I won’t miss this one completely. Perhaps I will even find some eager souls to help playtest Eye of the Qlippothim, too. After kicking up a flurry of bytes by making the rounds to get the word out about Fall-loha, I find I completely forgot to post about it here. Fall-loha 2011 marks the return of the Green Mountain Game Days to the Burlington area since we launched into this endeavor of hosting quarterly game days all around the state of Vermont. It promises to be as much fun as all the others. Saturday, August 27th — we’re getting a jump on fall, so it won’t see us coming — the fun is at the United Church of Underhill, right in Underhill itself. Over the last year, we’ve learned a few things about how to do these game days: people don’t seem to care what kind of soda is on hand, as long as it’s there; board game tournaments aren’t very popular; some folks like to take advantage of the block of time to play out the long games: Battlestar Galactica and so on. Personally, I shall be attempting a playtest of my GURPS Cabal adventure for Carnage. That gives me a set amount of time in which to do my prep work, including character creation. Should be a good time, no matter what. I hope to see some Burlington folks there who don’t normally get out to these game days. Chuck (standing) checks in on the crew of the Burlington InSpectres franchise: Suri, Siobhan, Frank, Charlton, Joe and Andy (left to right). Last Saturday at the Summer Game ‘n Grill, we got to play two, count ’em, two role-playing games. And I didn’t have a brain fart as embarrassing as at Lyndonville, so I’m counting the day as a complete win. The early morning was spent setting up the grange — stocking the fridge and snack stand, shifting tables — and then waiting for a critical mass of role-players to arrive, namely the crew from central Vermont. Once they rolled in, we got to business.